Hey folks, I receive a massive amount of emails asking where to find the SKB pens. So in order to lighten the load of responses I send, I asked the person that has the pens if it's cool for me to post contact info... she said yeah. .....and ask for the pens. If I may digress, I've had artists mention that they can't figure out how to draw like James with the pens once they get them. James just draws incredibly well. Just owning the pens will not give you any drawing super powers....it takes a talented draftsmen to get the results James' gets ( I know I don't). 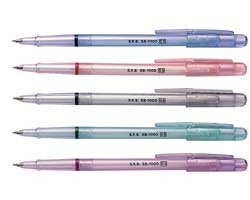 I'm just discouraged by the amount of people that feel owning the pens will give them superhuman skills. But don't get me wrong, they are nice pens, and I know the emails have the best of intentions, but to draw like James, you have to draw as much as him. This reminds me of a little story from the early days in art school. I was in head drawing with our teacher Lori Madden and I stopped after class to ask her about our materials. "Hey Lori, what brand and softness charcoal pencils are you using?" "hmm... what kind of bond are you using?" "just the short stacks they sell in the student store"
"I can't figure out why your drawings look so much nicer than mine, I can't make the same lines you get"
and she smiled and said to me "it's not the pencils, it's the artist"
I am kinda curious about these pens, but my guess is they must be really expensive and, since I'm an unemployed student with no money, my trusty papermate pen will have to do, haha. How do they feel? Are they nice? Looking forward to see your new work. I just got my pens today actually. They are generally sold in 12's and don't cost much. I like them so far, but need a little while longer to really give them a run. Thanks for the info! I'm always on the lookout for nice pens. Well said, here here. James's solo show sold out before it even opened, no way pens to that! Thanks for the info on the pens! bah! i'm a bit pen crazy too so i thought i'd give them a shot. i've been trying these out for a few days now and am finding my with them. i thought i was drawing worse (if it's possible to be any worse, lol) with them when i started so that just goes to show you, ha ha. the range on them is pretty crazy. and no, they're not that expensive. That's hilarious/ridiculous. I'm assuming those naive questions are from students - maybe even high school - so I wouldn't want to berate them too much, but you have to wonder how dedicated to the craft you are as an artist if you're simply looking for a quick fix. Another example of this is Photoshop, it can be incredibly complicated and powerful but it takes time and practice to achieve a look (something JJ aced early in his career). It is reassuring to know that practice WILL make you better and I think these blogs prove that. Look at these amazing life drawings and sketches Francis has done. It forces me to get back to drawing and drawing and drawing everyday. Thanks for the inspiration! Can someone just post the store or website? Seriously, this secrecy over a pen is a little silly. http://www.skbpens.com has them. Doesn't seem too hard to find. Not really a big secret, it's just that in the beginning I was just selling some of the extras via word-of-mouth to other artists.